We perform professional steam oven repair. 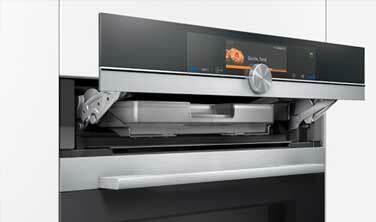 The steam oven is the latest innovation in cooking. They are still relatively new to modern kitchens. Steam ovens work by heating with moisture either by a container you fill with water manually or by a direct plumbing connection depending on the model. They are very healthy and very convenient. They defrost, steam, proof, bake slow cook, and reheat. But if your steam oven brakes you will need professional help. Our company can help you to bring your broken steam oven back to life! We know everything there is to know about repairing, installing and maintaining steam ovens. Our technicians are factory trained and certified by all the major steam and convection ovens manufacturers such as Bosch, Jenn-Air, Miele, Smeg, Thermador, and Wolf. Steam ovens are very high tech. They have a lot of digital panels, and settings are running a temperature, etc. You need a professional to repair it if it brakes. We are such professionals. Our team will troubleshoot any problem you might have with your steam oven and find the best solution for you. We will find, deliver and install all the parts that need replacement. We also do maintenance on your appliance. Besides in-depth knowledge of steam oven repair also offer you excellent customer service. Our team is always friendly and professional. They are ready to answer any question for you and find the right solution. Our company offers accurate estimate before any job and FREE service call with any major home appliance repair. We also order for you the best and most reasonably priced appliance parts on the market. We are so sure those parts that we offer a 3 yearwarranty on the parts we install. We are a company with a lot of appliance repair experience. Even though steam ovens are relatively new, we know everything there is to know about steam oven repair in Oakland. That includes refrigerator, washers, dryers, dishwasher, stoves and ranges, ovens, microwaves, freezer, ice makers, barbecues, pizza ovens, patio heaters and much more. We are a family owned and operated business. Our service area includes East Bay, Marin County, Oakland, and Novato as well as surrounding areas. That includes Alameda County, Alameda, Berkley, Dublin, Hayward, Livermore, Oakland, Piedmont, Pleasanton, San Leandro, Contra Costa County, Antioch, Brentwood, Clayton, Contra Costa, Concord, Danville, Discovery Bay, East Bay, Lafayette, Oakley, Orinda, Pittsburg, San Ramon, Walnut Creek, Santa Clara County, Sunnyvale. Our team is qualified to do both residential appliance repair as well as commercial appliance repair. With years of experience and knowledge behind our belt, you can be sure that we will take great care of your steam oven. We work on all brands and models of home appliances such as Asko, Bertazonni, Bosch, Dacor, DCS, Electrolux, Fisher&Paykel, Frigidaire, GE, Jenn-Air, KitchenAid, La Cornue, LG, Liebherr, Marvel, Miele, Perlick, Samsung, Siemens, Sub-Zero, Thermador, Traulsen, True, Viking, Whirlpool, Wolf. In fact, after a steam oven repair in Novato appointment with us, you will get an entirely functional appliance that you can use for years to come without breaking. When you need steam oven repair, all you have to do is give us a call. We will make a repair appointment at your convenience. Our qualified technician will be on his way to you as soon as possible. He will carry with him all the tools, parts, and equipment that is necessary for your particular project. As soon as he gets to your home, he will start working on your steam oven. Our technicians are fast, detail oriented and precise in their work. They know what they are doing. The technician will get to work right away. He will replace parts, troubleshoot and do whatever it takes to get your steam oven working again. After the job is complete, our technician will make sure your unit is properly plugged in and is safe to use. He will not leave until you are totally satisfied with his work. We always make sure our customers are happy and get what they want. Besides repairs, we also offer an annual or bi-annual appliance maintenance service. Our team can come in once or twice a year check up on all of your kitchen equipment. In the long run, you will save money. All of your kitchen equipment including steam oven will be in top shape for years to come. Why pick us to do steam oven repair for you? Steam ovens are new technology. Not every appliance repair company knows as much about them as we do. We have been on top of all the latest innovations in kitchen appliances. Our team is factory trained and certified. We know everything there is to know about steam oven repair and can help you resolve any issue you might have. With us, you can be sure to get quality repair service because we stand by our work and guarantee customer satisfaction. Give us a call, and we will make sure that your steam oven is fully functional! We have to convenient locations. One is in East Bay and one in Marin County. This makes us available to come and do steam oven repair in Oakland area as well as steam oven repair in Novato area, and it’s surroundings. For all your steam ovens repair in Oakland and steam ovens repair in East Bay call us at 925-265-7782. For your steam ovens repair in Novato and steam ovens repair in Marin County, please call us 628-214-0064. Or you can fill out our short contact form. We would love to talk to you and answer all of your questions about appliance repair. 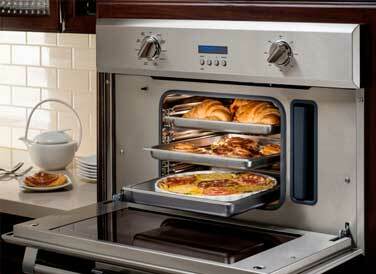 Best steam oven repair in Novato and best steam oven repair in Oakland. I was pretty surprised when my relatively new Miele steam oven started giving me trouble. It would not hold steam like it used to. And the food was not coming out well cooked. I thought I still had it under warranty but I did not. Fortunately I was able to find a company that helped me with quite a few problems I was having. Top Home Appliance repairman came over and was able to pin point the problem. He got the parts and installed them within few days. Now my oven is working fine. Top Home Appliance are true professionals. They work fast and they get you all the parts fast! I would recommend them for all of your appliance repair needs.